Claddagh charm bracelet features a gold plated heart charm. This junior size Claddagh bracelet features a 3/8' wide, double sided, rhodium plated Claddagh charm with oxidized accents and a gold plated, 1/4" wide, heart charm. 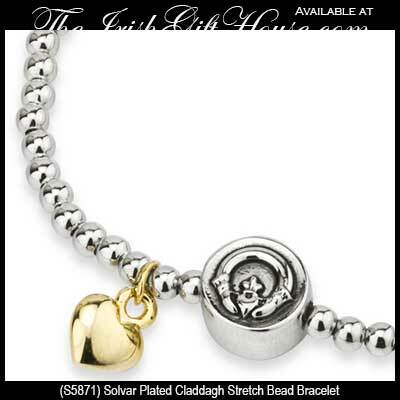 The rhodium plated stretch Claddagh bead bracelet measures about 2 1/2" oval when not stretched. This smaller Claddagh bracelet is sized for smaller wrists and would be a good size for most teenage girls and small women. 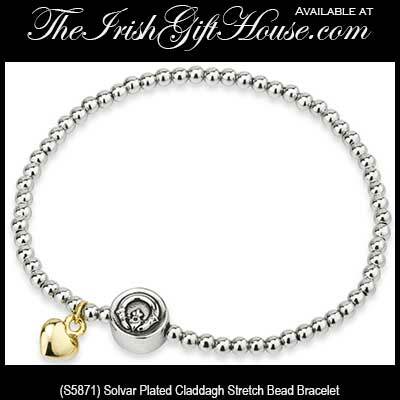 This bracelet is gift boxed with a Claddagh legend card, complements of The Irish Gift House. It is part of the Tara Collection made by Solvar in Dublin, Ireland. Tree of Life bracelet is a small design that is enhanced with a Trinity knot charm. Shamrock charm bracelet features a Trinity knot charm too. Trinity charm bracelet is a plated Celtic design that is enhanced with a shamrock charm.